Shortly after I moved to France last year, Glenn Fleishman offered to introduce me to his contacts at a company called Violet that’s based here in Paris. (And thus, by the way, it’s pronounced “vee-oh-LAY.”) Violet is best known as the developer of the Nabaztag Internet-enabled rabbit, and this product sounded sufficiently wacky that I was delighted to pay its creators a visit. It turned out they’re located just down the street from me, about a ten-minute walk away, and I’d unknowingly passed their offices dozens of times already. 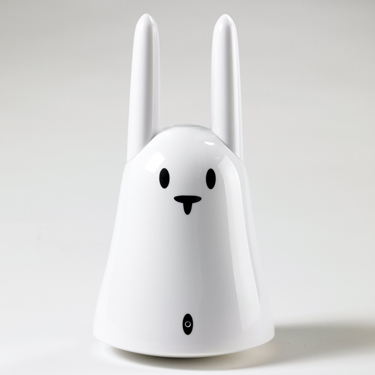 So I set up an appointment, and Morgen and I met with Rafi Haladjian (one of the Nabaztag’s inventors) and Jean-François Kitten (yes, apparently his real name) for a personal, hands-on demo of the Wi-Fi bunny. That was more than seven months ago. Ever since, I’ve intended to write about the Nabaztag and the philosophy behind it, but every time I’ve started pondering what to say, I’ve gotten profoundly stuck. Even now, I’m not entirely sure what to think of it. I believe I could argue with equal conviction that this device is surprisingly useful or a ridiculous waste of $165. In any case, there’s certainly more to this gadget than meets the eye. Luckily (or unluckily, depending on your point of view), little appears to have changed in the Internet rabbit arena since last fall, so I believe my observations are still pertinent. Nabaztag Basics — First things first: how does one pronounce this strange word? I wrote it phonetically in my notes the way its designer said it – roughly, “NAB-us-tag,” where the stress is on the first syllable and the middle vowel is a schwa. It’s the Armenian word for “rabbit,” and it seems to make as little sense to French-speaking people as it does in English. In case you’ve not kept up with the news in rabbit technology over the past few years, let me give you a quick description of the Nabaztag. It’s a rounded conical hunk of plastic about 9 inches (23 cm) tall (including the two protruding ears), with eyes and a nose painted on front, a belly-button microphone, and a single button on top – but no other visible user interface. You plug in the AC adapter (it doesn’t work with Energizer batteries, sorry) and it connects to the nearest open Wi-Fi network. (There are provisions to use password-protected networks, too, though they require a bit of fiddling to set up.) When the bunny powers on, several multicolored LEDs glow from behind the plastic case, and the motorized ears spin around in a manner that would surely be quite painful for a real rabbit. Although the Nabaztag comes pre-configured to deliver certain kinds of information right out of the burrow – um, box – the company expects and encourages extensive personalization and even hacking; they also offer an API for third-party developers to create their own applications and services. (Some Nabaztag services are free, by the way, while others require a paid subscription.) There’s even a healthy aftermarket for replacement ears in a variety of colors and patterns. By the way, I should mention that the current generation of Internet rabbit is called “Nabaztag/tag” – I guess that’s Armenian rabbit-speak for “rabbit 2.0” – the original Nabaztag, which is still available for about $95, doesn’t include the microphone or RFID reader, and doesn’t support WPA encryption or streaming MP3 audio. The company representatives I spoke to said that future generations would be designated with additional “/tag” endings. Perhaps they’ll come with a selection of RFID Nabaztag/tag/tag tags. Down the Rabbit Hole — All right, so you can buy this groovy little bunny appliance thingy that can do a million and one things, but who really needs one? The candid answer, according to Violet’s Haladjian, is no one. He’d be the first to admit, he says, that Internet rabbits aren’t going to change the world, that he’s not looking to build the future of his company on plastic bunnies. The Nabaztag is simply the first example of a larger idea Violet is trying to promote – that of leveraging the power of ubiquitous wireless Internet access to turn ordinary objects into smart objects. We’re accustomed, he explained, to having a computer screen (or, at least, some kind of screen) mediate our experience of the Internet. But although computers make good all-purpose tools, there’s life beyond the PC – and there are other, simpler and more direct ways to use that near-universal connectivity. So think of the Nabaztag as a rather elaborate proof of concept for a future in which lots of friendly little objects can do lots of useful things by virtue of being connected to each other and to a global source of infinite data. Violet’s ambition is to connect everything in the world, and they’re starting by connecting small, familiar-ish objects. That word “friendly,” by the way, is key. As an example, Haladjian cited home automation systems, which have been around for decades, but which, he says, are still complex and intimidating enough to scare away many people. A little rabbit with funny ears and a single button, on the other hand, isn’t intimidating. You interact with it in natural ways like talking to it and holding objects in front of it rather than by connecting wires and looking at a screen and typing or mousing. So it hints at a more user-friendly future of invisible computing in which much simpler objects with embedded computers replace many of the functions for which we currently rely on full-blown desktop or laptop computers. This idea, of course, is not unique to Violet or the Nabaztag. For example, a company called Ambient offers a number of small Internet-enabled devices, such as the $150 Ambient Orb, which glows in different colors to indicate information like traffic, weather, and stock prices; and the $124.99 Ambient Umbrella, whose handle glows when rain is expected. You can buy standalone devices to stream Internet radio, and even the Apple TV is a type of Internet appliance. (There’s also the $179.95 Chumby, a little Wi-Fi-connected gadget that can serve up the time, weather, traffic, news, music, and so on – though unlike the others mentioned here, it still relies on a conventional LCD screen to display data, making it more like a keyboard-less computer than an appliance; see “Chumby: The Beanbag Computer,” 2007-12-14.) In any case, the Nabaztag is the only one I can think of with anthropomorphic (or, uh, kuniklomorphic) characteristics. The question is why someone might find a Nabaztag (or any other such appliance) worth buying when their existing, conventional computer can do almost all the same things (though I’ve never seen a Mac with motorized ears). The Violet reps suggested that the Nabaztag is especially good for applications that aren’t worth your full attention – for providing information in the background, perhaps even while you’re focused on some other task on your computer. I think that’s on the right track. I can attest that as an introvert, I’d be much less distracted by unobtrusive glowing lights on a device over on the table than by something popping up on my screen all the time, and I might even be more inclined to report my status or mood using rabbit-ear semaphores than typing a tweet or changing my iChat status (see “Instant Messaging for Introverts,” 2008-04-04). Multiplying Like Bunnies — Apparently enough people have seen past the weirdness of the Nabaztag’s design to make it quite a successful product. In fact, according to Violet, when the original Nabaztag was introduced in 2005, their first 5000 units sold out in 10 days, even though it was the middle of the summer and the device had been advertised only by word of mouth. My sense, from looking at the activity level of various blogs and forums devoted to the Nabaztag, is that the device’s earlier popularity is waning. Violet has been slow to release promised improvements (such as the Ztamps, which had been scheduled for delivery last October), and I’ve seen no sign of the impending arrival of a Nabaztag/tag/tag. But that may be a moot point, because Violet’s stated intention is not to put a Nabaztag in every home. They’ve got loftier goals, and for all I know, they may be well on their way to meeting them. As for me, I can certainly get behind the concept of invisible computing, and I can see the value of having lots of smart objects in my home. They may even enhance my communication with others in a way that ordinary computer software never could. The Nabaztag in particular may not quite scratch my itch, but I’ll be watching future developments in this area with great interest.